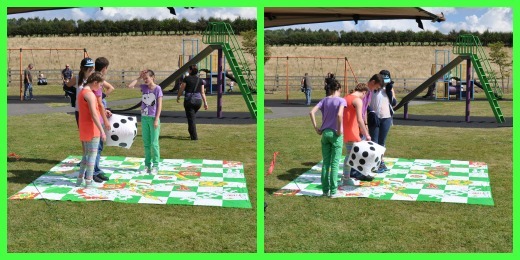 I wanted to share and say thanks again to one of our donators last year Big Game Hunters - they kindly donated a giant outdoor Snakes and Ladders Game which we had set up on the day for the kids and adults to enjoy, the game was a fab donation as it will give again this year when set up for use. If you think you could donate an item that could be used at our 2013 Grayson's Great Funday please do email me !!!! 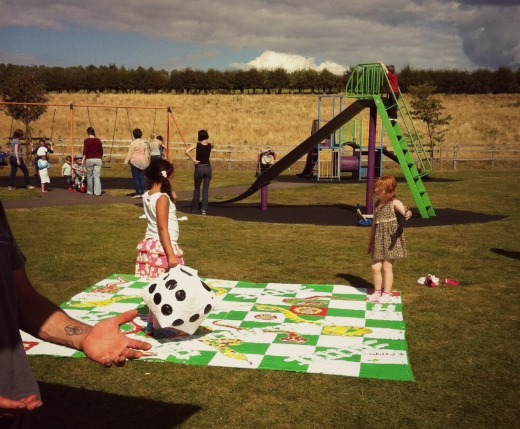 One of the companies that helped us was Garden Games, they donated a fab Giant Outdoor Snakes and Ladders, which we put out for the kids (and a few adults) to enjoy whilst at the Funday. This year it will be set up again as it was such a hit. At £41 the game is a steal and will bring years of fun, it's so easy to set up and took me less than 5 minutes, it's a case of pushing the stakes into place and blowing up the dice, measuring 10ft squared it literally can be enjoyed for anyone over 2 yrs old, although Addy at just over a year did enjoy playing on it too. Completely washable plastic it's fantastic for being used outside, but packs up into a tiny box, I was asked by so many people at the funday where I had got it as it kept the kids entertained for ages, plus it really is a family classic.